I recently bought a big bag of dates from Costco for a recipe. Of course everything at Costco comes in a large bag so I was left with a lot of leftover dates that I had to figure out how to use. Dates are sweet so they lend themselves well to both sweet or savory dishes. I love the balance of sweet and savory so I decided to make a spicy and savory chutney to go with rice and curry meals or roasted meats. This chutney comes together quickly if you have a food processor to help you grind everything up. I served this chutney to my own "top chef judge" --also known as my mother and she loved it. 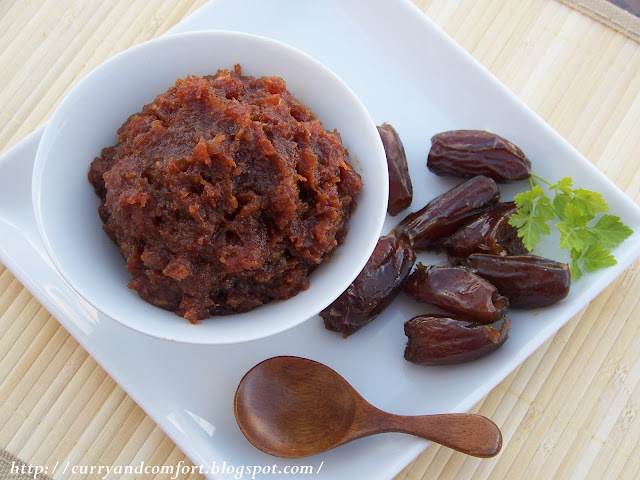 Now I may have to buy another bag of dates just so I can make this chutney again and again. 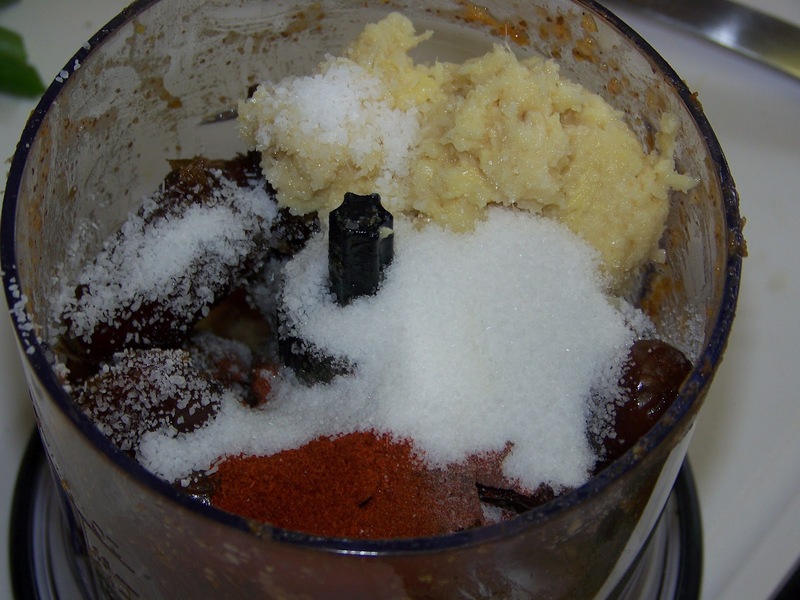 In a food processor blend together 1 1/2 cups of pitted dates, 1/2 cup of vinegar, salt, sugar, ginger, garlic, and chili powder until it forms a coarse paste. 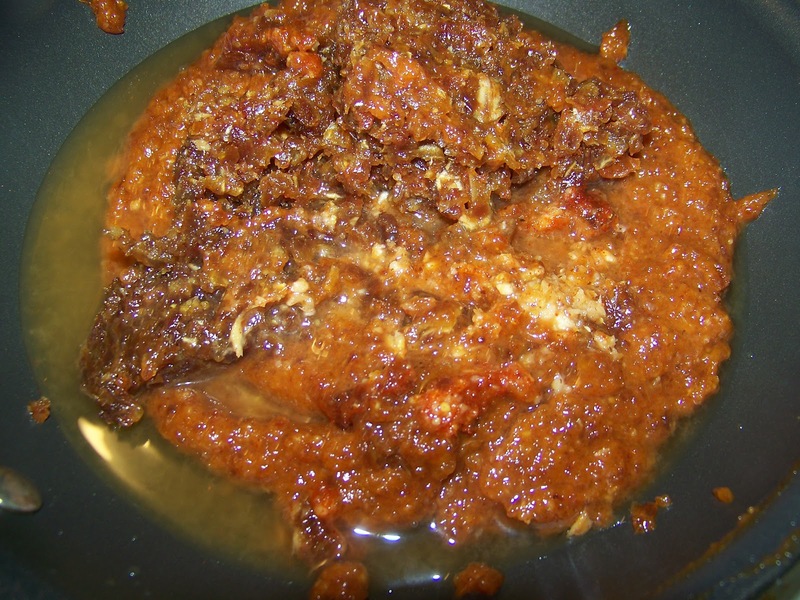 Remove paste to a pan. Then take the remaining half cup of dates and pulse until it's forms a coarse chop and add it to the date paste (this step also helps clean out all the paste from the food processor). Add 2 Tbs of vinegar to a pan with the date mixture and cook on medium low heat until it starts to bubble gently and become sticky(about 8-10 minutes). Taste for the balance of salt, chili, sweet and tart (from the vinegar). Add a little more of any component that is not balanced. Allow to cool and serve with rice and curry or roasted meats. Keep in an airtight container in the fridge. Enjoy. Yes everything from costco always comes in large bag :) I love Date,but I never tought mix with spicy,sound flavorful with these ingredients,great idea to use up some leftover, Yummy and interesting recipe !! 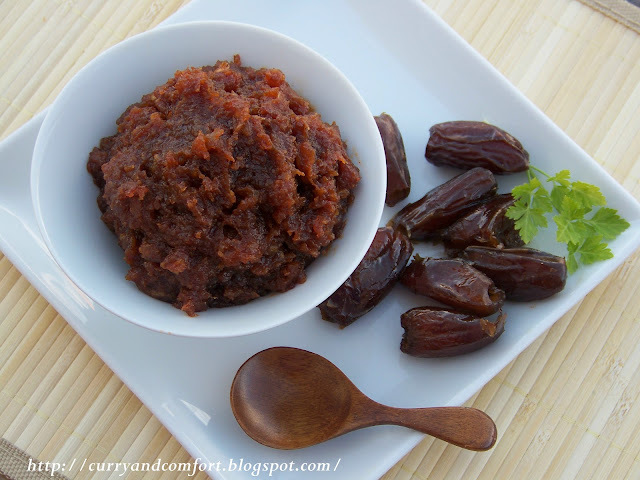 I need to try your version of date chutney...soon. It looks very tempting. I make a date chutney, which is a little runny, using tamarind sans ginger and garlic. Awesome chutney and with ginger and garlic added, shud have been very flavorful..
Mmm, I can only imagine how delicious this is! What a great idea, Ramona :) Beautiful pictures, btw! Have a great week, my friend! You made a chutney to go with curry meals??? Really? Whoda thunk it. 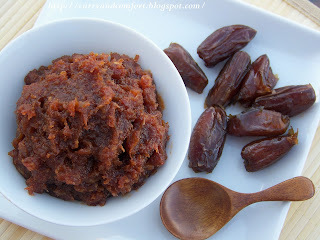 :) I love dates and would eat this straight out of the bowl. It looks fantastic. What a beautiful chutney and a great flavor. This looks so delicious! Wonderful recipe. Thanks for sharing! I never dare to add ginger and garlic to date chutney. but yours looks perfect. i will try when I get chance. That looks absolutely amazing--I would love it with some flatbread. Love that you've added a bit of heat to keep it from being just too sweet! I am not sure I have ever dates before. Actually, my mom made a cookie once that had dates in it, but I was not a fan. They are all over the place though, so maybe I need to take a second chance! I love dates. I love chutney. Looks like this recipe has my name written all over it. Costco will get ya everytime won't it? Bookmarked! I also just added dates to my Costco list! What a sweet and savory dish and I can see being used in so many way aside from just eating right out of the bowl. :) Great creation! I love dates and now you have me wanting to search for this large bag on our next Costco trip! And great idea to make it into a chutney! It looks so yummy! I love when you buy big bags of stuff! It means I can look forward to a bunch of recipes with a really great ingredient :) Dates are very popular here, so I'm always on the lookout for a great recipe. This sounds great, I bet this would be great on meat. Thanks for sharing, I hope you're enjoying your week! Ohhh, This would be so good with rice.